It is not rare for mothers and daughters to take trips across the country–or even across the world–together. But to travel together to serve as medical missionaries to a third-world country might be a little more rare. That is just what Elizabeth Soto and her mom Tricia Jester did this summer. 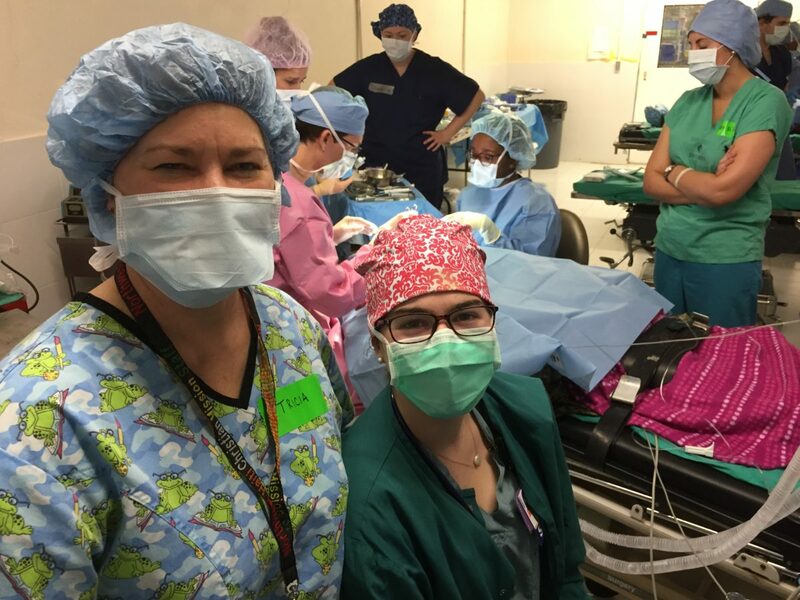 Instead of your traditional summer vacation, Elizabeth and Tricia packed their bags and headed to Saint-Louis-Du-Nord, Haiti, with Northwest Haiti Christian Mission, to assist with eye exams and surgeries for the impoverished living in the area. For Elizabeth, this trip quickly became “one of the most treasured moments of [her] life.” She has long been inspired by her mom and has chosen to follow in many of her footsteps. Tricia Jester graduated from the Sinclair School of Nursing in 1982 and went on to work for University Hospital in the cardiac ICU. It was there that she decided she wanted to pursue a career as a cardiac nurse specialist, so she moved to Alabama to pursue the Cardiac CNS program at the University of Alabama-Birmingham (UAB). However, while she was there, her career took a little twist. While in the process of applying to Cardiac CNS programs, she shadowed in the recovery room and learned about being a nurse anesthetist. UAB also happened to have a nurse anesthesia program, so she decided to apply there and got accepted. The rest, as they say, was history. She graduated in 1988 from UAB as a nurse anesthetist and has continued that career since then. Nurse anesthetist is not her only role, though. Tricia has raised two daughters, Elizabeth and Ami. And she must have done something right–both have also gone on to graduate from the Sinclair School of Nursing. Elizabeth graduated in May 2012, Ami in December 2014. Ami worked for a little over a year at University of Missouri Psychiatric Center as a mental health nurse before accepting a job at Research Medical Center in Kansas City. She has not left the University, however. She is just beginning the DNP program to become a mental health nurse practitioner. Elizabeth is also continuing her education, but she is once again following in her mother’s footsteps. She is currently enrolled at the Truman Medical Center School for Nurse Anesthesia in Kansas City. Learning more about her career has given Elizabeth an increased appreciation and deeper respect for her mom, especially from a professional viewpoint. Elizabeth has cherished conversations with and advice from her mom while going through this round of schooling, but this trip was a way for her to learn from her mom hands-on. Tricia served as Elizabeth’s preceptor while in surgeries. The group was in Haiti to serve at the eye clinic. Many came to get exams and glasses, but some also required more extensive care. This is where Elizabeth and Tricia served. They helped get patients ready in the pre-operative area by putting in eye drops to dilate the eye so the surgeon could operate, put in IVs and performed eye blocks, local anesthetic to provide anesthesia and analgesia to the eye during surgery. They also were a part of surgeries such as enucleations, where the eyeball was removed, and pediatric cataract surgeries. These surgeries required general anesthesia, and the pair used their skills to administer the anesthesia. The pair both have a passion for serving in third-world countries, whether through church or medicine, and both said this trip was a reminder to go back to the basics of the work they love. “Anesthesia is the same both here in the United States and in a third-world country like Haiti,” Elizabeth says. “Even though we have more bells and whistles, newer technology and more equipment, the process is still the same. We gave the same drugs that we give here in the United States. I was impressed with how easy it is to rely on all of our high-tech bells and whistles–there is a monitor for anything and everything here–but down in Haiti, they might not have it. From working side by side, the mother-daughter duo found that it may not only be a love for nursing that’s genetic, but the way they perform the trade too.